Published in the New Zealand Government Gazette (Province of New Munster) in 1850, this represents the earliest attempt to record details of early Maori in the Wellington region. The notes read " Taken under the direction of Government, Embracing Statistical returns, in connection with the Native Population, and other Miscellaneous information withinj the Districts of Port Nicholson, Porirua, Waikanae, Otaki, Manawatu, Rangitikei, and Wairarapa, in the province of New Munster, in the beginning of 1850. 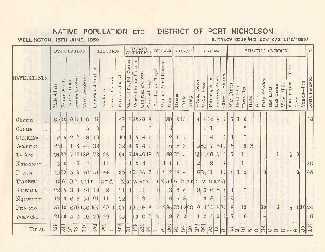 The Census was conducted by H. Tacy Kemp, Native Secretary. Click the image to view larger versions. 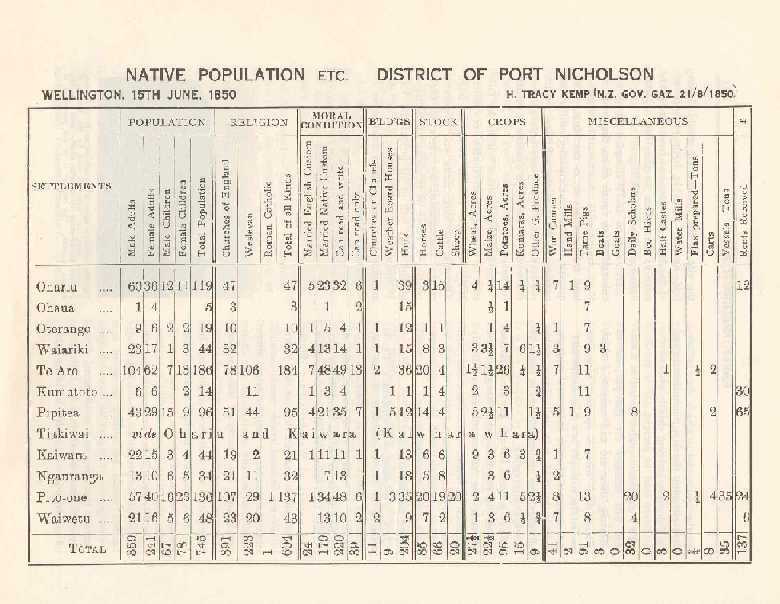 Port Nicholson, included settlements or pa at Ohariu, Ohaua, Oterongo, Waiariki, Te Aro (the largest), Kumutoto, Pipitea, Kaiwara, Ngauranga, Pitone and Waiwhetu. For further enquiries, contact the Maori Customer Specialist, Telephone 801-4114.